Do we tax energy enough? To learn the answer, you can watch a symposium at AEI, including one of my favorite economists. Apparently, there is some dispute about the authorship of the story. Richard Zeckhauser (with Peter Schuck) on good programs and bad apples. Larry Summers on why policymakers need to look ahead. For decades, Alan S. Blinder -- Princeton University economist, former Federal Reserve Board vice chairman and perennial adviser to Democratic presidential candidates -- argued, along with most economists, that free trade enriches the U.S. and its trading partners, despite the harm it does to some workers. "Like 99% of economists since the days of Adam Smith, I am a free trader down to my toes," he wrote back in 2001. Politicians heeded this advice and, with occasional dissents, steadily dismantled barriers to trade. Yet today Mr. Blinder has changed his message -- helping lead a growing band of economists and policy makers who say the downsides of trade in today's economy are deeper than they once realized. Mr. Blinder, whose trenchant writing style and phrase-making add to his influence, remains an implacable opponent of tariffs and trade barriers. But now he is saying loudly that a new industrial revolution -- communication technology that allows services to be delivered electronically from afar -- will put as many as 40 million American jobs at risk of being shipped out of the country in the next decade or two. That's more than double the total of workers employed in manufacturing today. The job insecurity those workers face today is "only the tip of a very big iceberg," Mr. Blinder says. [Mr. Blinder] was silent when his former Princeton student, N. Gregory Mankiw, then chairman of President Bush's Council of Economic Advisers, unleashed a political firestorm by reciting standard theory but appearing indifferent to pain caused to those whose jobs go overseas. "Does it matter from an economic standpoint whether items produced abroad come on planes and ships or over fiber optic cables?" Mr. Mankiw said at a February 2004 briefing. "Well, no, the economics is basically the same....More things are tradable than...in the past, and that's a good thing." Mr. Blinder says he agreed with Mr. Mankiw's point that the economics of trade are the same however imports are delivered. But he'd begun to wonder if the technology that allowed English-speaking workers in India to do the jobs of American workers at lower wages was "a good thing" for many Americans. I believe Alan is terribly wrong-headed about this topic. Suppose some country had high tariffs that prevented many goods and services from being imported from abroad. Then a new President eliminated the tariffs. Alan would, I believe, applaud the policy move, despite job losses for some workers in previously protected industries. But the rise in offshoring is much the same. If changes in technology suddenly make previously nontraded goods and services tradable, that has precisely same effects as removing tariffs. In both cases, a barrier to trade has fallen. We would import more, and there would be some painful dislocations, but the nation overall would enjoy greater prosperity. For some reason, Alan does not respond to this rise in technology-driven offshoring as he would to a rise in policy-driven trade. But economic logic suggests that if he is to embrace tariff reductions as an economic positive, he should similarly embrace technology-driven trade increases an an economic positive. But instead of recognizing this change as primarily a force for good, he offers mainly hand-wringing. In doing so, he gives, perhaps unintentially, aid and comfort to the protectionists. Meanwhile, I am still rooting for the Jedi. Just to let you know, I'm a big fan of yours and some of your work has inspired me to pursue a career in Economics. I just have one question for you - that may seem silly, but hey, - your educational background is very impressive - but did you ever struggle with any of the courses you studied as a student? Sometimes, an academic life can be a struggle, can't it? Or do you find it all fun? Thanks for reading this. I know you are very busy so I'll understand if you don't reply. You are an inspiration. 1. Those that required motor skills. I was solidly in the bottom quartile of my junior high school and high school classes in shop, typing, and physical education (but somehow I managed to become captain of my high school fencing team). 2. Those that required good memorization skills. Languages in particular were a weak point in my academic career, mostly because I had trouble learning the large quantity of new vocabulary words. 3. Those that required large quantities of reading. I have always been a slow reader. This was a particular handicap when I was a law school student. But the most difficult time for me was when I had to accept the limits of my mathematical abilities. Math was my strongest subject in high school. I got an 800 on the math SAT, won the high school math prize, and didn't really feel like I was working hard at it. I thought I was hot s***. But then I got to Princeton and met people who were really good at math, the kind who become serious mathematicians, and I began to see the limits of my aptitude in math. I took some hard math courses there and did okay at them, but I was far from the top of the class. Many econ grad students at Harvard, maybe most, are stronger in math than I am. In recent years, some of my coauthors (such as Ricardo Reis and Matthew Weinzierl) have been Harvard students with strong technical skills. My comparative advantage in the coauthorial quid pro quo is based on experience, intuition, writing skills, and a pretty good nose for interesting questions. One of the nice things about being a professor is that you can specialize in those things you are best at, and you can find collaborators that compensate for your weaknesses. In other words, being a professor is a lot easier than being a student. Hearing arguments in a case about retail prices, the Supreme Court's justices seemed divided over whether to overturn a 96-year-old antitrust ruling intended to promote competition. In yesterday's case, Leegin Creative Leather Products of Industry, Calif., challenged the ruling, which prohibits manufacturers from requiring retailers to sell their products for a set minimum price. A Texas federal district court cited the 1911 precedent in tossing out the "resale price maintenance" policy Leegin had imposed on Kay's Kloset, a Dallas-area boutique. Kay's Kloset, owned by PSKS Inc., brought the suit so it could sell Leegin's Brighton line of women's accessories at a discount. Leegin's attorney, Theodore Olson, argued in briefs that discount prices "degrade" the Brighton brand. And yesterday he said forcing retailers to charge higher prices could benefit consumers by helping ensure the stores would have enough money to provide attractive services to shoppers. Justice Antonin Scalia agreed. If the set prices give "the consumer a choice of more service at a somewhat higher price, that would enhance consumer welfare, so long as there are competitive products at a lower price," he said. Later, he said overturning the 1911 precedent could solve the "free rider problem," when "customers shop at the place that has the big showroom" to learn about a product, but then buy it at a lower price from somebody else who has not incurred that expense." The Bush administration, along with the National Association of Manufacturers and other business groups, backed Leegin. But 37 states, represented by New York, and the Consumer Federation of America urged the court to retain Dr. Miles. One example of a controversial business practice is resale price maintenance, also called fair trade. Imagine that Superduper Electronics sells DVD players to retail stores for $300. If Superduper requires the retailers to charge customers $350, it is said to engage in resale price maintenance. Any retailer that charged less than $350 would have violated its contract with Superduper. At first, resale price maintenance might seem anticompetitive and, therefore, detrimental to society. Like an agreement among members of a cartel, it prevents the retailers from competing on price. For this reason, the courts have often viewed resale price maintenance as a violation of the antitrust laws. Yet some economists defend resale price maintenance on two grounds. First, they deny that it is aimed at reducing competition. To the extent that Superduper Electronics has any market power, it can exert that power through the wholesale price, rather than through resale price maintenance. Moreover, Superduper has no incentive to discourage competition among its retailers. Indeed, because a cartel of retailers sells less than a group of competitive retailers, Superduper would be worse off if its retailers were a cartel. Second, economists believe that resale price maintenance has a legitimate goal. Superduper may want its retailers to provide customers a pleasant showroom and a knowledgeable sales force. Yet, without resale price maintenance, some customers would take advantage of one store's service to learn about the DVD player's special features and then buy the item at a discount retailer that does not provide this service. To some extent, good service is a public good among the retailers that sell Superduper products. As we discussed in Chapter 11, when one person provides a public good, others are able to enjoy it without paying for it. In this case, discount retailers would free ride on the service provided by other retailers, leading to less service than is desirable. Resale price maintenance is one way for Superduper to solve this free-rider problem. The example of resale price maintenance illustrates an important principle: Business practices that appear to reduce competition may in fact have legitimate purposes. This principle makes the application of the antitrust laws all the more difficult. The economists, lawyers, and judges in charge of enforcing these laws must determine what kinds of behavior public policy should prohibit as impeding competition and reducing economic well-being. Often that job is not easy. Update: Here is the NY Times article on the case. Some economists question Mr. Lazear's assertion that, for instance, raising taxes on higher-wage earners will reduce individuals' incentive to acquire new skills. Lawrence Katz, a Harvard University labor economist who served in the Clinton Labor Department, says there's "not a shred of evidence" lower taxes boost educational attainment. "That's first-order goofball." Like Larry, I also don't know of any evidence for the impact of taxes on educational attainment. On the other hand, producing evidence would not be easy, as current taxes are less relevant for educational choice than expected future taxes. That is, in deciding how much to invest in skill acquisition, a young person would have to consider expected tax rates that would apply over the next several decades of working. Eddie's view that taxes matter for human capital accumulation seems like a plausible hypothesis. Reasonable people can disagree about the likely magnitude of the effect. This situation exemplifies a common conundrum for policy advisers like Eddie. In the absence of hard evidence, should he act as if there is no effect, as Larry seems to be suggesting here? Or should Eddie rely on the general principle that people respond to incentives and make an educated guess about the magnitude? In this case, as in many others, being an economist involved in the policy process is harder than being an economist in academia. Academics can easily say "I don't know" and move on to another question. Policy advisers are often required to take a position on the key issues of the day, sometimes in the absence of reliable evidence. I noticed that you have a posting on the quotes from me in yesterday's WSJ piece on inequality. In fact, the quotes are taken out of context and not quite accurate based on my memory of my conversation with Greg Ip from a couple weeks ago. I know this does not affect the themes of your posting, but I do want to clarify what I believe I actually said and meant. Most of my interview with Greg Ip of the WSJ focused on how I substantially agreed with Eddie Lazear's view that a major part of the growth of U.S. earnings inequality is driven by rising returns to skills and the interaction of sharp secular increases in skill demand combined with slower growth in the supply of skills (education) in the U.S in recent decades relative to the past. A tiny part of my discussion with the Ip involved my reaction to the notion that cutting tax rates for top end (top 1%) earners would reduce inequality by stimulating college enrollments. The "goofball" quote is actually not about the notion that the supply of skills might be somewhat responsive to tax rates but about the notion that the main strategy for addressing the U.S. inequality problem is the lowering of marginal tax rates on the top 1% of earners. I did suggest that small increases in top marginal rates to fund a more generous or broader EITC (to expand the EITC to cover poor singles without kids) or to help with college access could have the potential to play a small role in reducing inequality without large efficiency costs (and possibly even with efficiency gains by improving work incentives versus crime incentives through a broader EITC or by helping overcome capital market/information constraints for college investments). I also noted (and believe) that we have pretty good evidence that college entry decisions respond to the college wage premium but scant evidence on the effects of top end tax rates on college enrollment decisions. I never said anything about general educational investments and tax rates, I specifically talked about college enrollments and marginal tax rates at the very top end of the distribution. Furthermore, I was (and am) skeptical that given the huge increases in private sector returns to skills in the past 25 years (a doubling of the college premium for young workers and even larger increases for post-college training) that modest changes in tax rates at the top end would be salient to students on the margin considering whether or not to make college investments. I suspect than college financial aid is much more salient than future top end tax rates to high school seniors on the margin of whether to invest in college. Top end tax rates are relevant for many things but those who are likely to be affected by them are not likely to be "marginal" with respect to going to and completing college. But it is interesting how much attention one can get if one uses the phrase "goofball." I'll need to remember to use this phrase again if I actually want to get attention. Thanks, Larry, for allowing me to share your insights. This blog started exactly one year ago today. Dear readers: Please use the comments section of this post for general comments and suggestions. What do you like? What do you not like? How can the blog be improved (recognizing that resources, including my time, have opportunity costs)? A year ago, when this started, I never would have guessed that the number of visits would now have passed 1.7 million. Thank you all for coming. if the monetary authorities were to become complacent and to think that they could get away with not reacting to shocks that, in their mistaken view, no longer have the potential to cause inflation to rise persistently, then inflation expectations would surely become unhinged again. In short, complacency that might arise from the current low inflation persistence might result in deja vu all over again and return us to an era like the Great Inflation. The stability of inflation could lead to complacency. As long as inflation expectations are well anchored, actual inflation will have a natural tendency to revert to the anchor of long-run inflation expectations. Under such circumstances, policymakers may be tempted to relax their resolve in responding to potentially inflationary developments. Such relaxation could be costly, however. Inflation expectations have become well-anchored because the public has become confident that the Federal Reserve will do the right thing. But this belief will persist only as long as we on the Federal Open Market Committee continue to ratify the public’s expectations that inflation will remain low and stable. Thus, complacency would be a threat to the credibility that the Federal Reserve has worked so hard to acquire, and its loss would likely mean the reversal of many of the favorable inflation developments seen over the past two decades. Why all this talk about complacency? Maybe, by talking about the risk of complacency, Rick and Randy are trying to tell people that they are not complacent in order to influence inflation expectations. Or maybe they are trying to persuade the other members of the FOMC to take a more hawkish stand against inflation. As of 2003, the average income of a French physician was estimated at $55,000; in the U.S. the comparable number was $194,000....Did I mention that health care is a labor-intensive industry? This is the major reason why French health care is cheaper than U.S. health care. Economic historian Barry Eichengreen has a new book on Europe. Here is a review. Here is the first chapter. Here, as a pdf file, is development economist Bill Easterly's recent oped on Africa's poverty trap. While income and wealth tend to rise steadily over the life cycle, peaking around retirement, happiness follows a U-shaped age pattern....for both men and women in the United States and throughout Europe, happiness starts off relatively high in early adulthood, then falls, bottoming out on average around age 45, and then rises after that year and on into old age....In the United States, the steady decline in happiness from age 16 to age 45 has an effect that's larger than a 50 percent reduction in income—that is, happiness varies more as people get older than it does if you compare significantly richer people to poorer ones. And, equivalently, the 15-year upswing in happiness that follows age 45 is stronger than the upswing that tracks doubling of income. MIT economist Abhijit Banerjee writes about the new development economics in the new issue of the Boston Review. Thanks to Tyler Cowen for the pointer. ...for making financial decisions. So say David Laibson, Xavier Gabaix, John C. Driscoll, and Sumit Agarwal. The WSJ reports about a well-paid economist. In today's NY Times, Tyler Cowen compares American and European health care. In academic economics, there is growing interest in a subfield called "dynamic public finance," which looks at optimal taxes and social insurance in situations where information unfolds over time. Here is one survey. Under one proposal, by Representative Jim McDermott of Washington State, the government would pay as much as 50 percent of the difference between a person’s old and new wage — with a maximum benefit of $10,000 a year — for as long as two years. A welder who lost a job that paid $40,000 a year and who took a new job paying $30,000 would receive $5,000 a year in supplemental pay for two years. Surprisingly, these two developments have been proceeding independently. As far as I can tell, the schemes being cooked up in Washington are not building on the academic literature, and the guys working on the academic literature do not pay much attention to what is happening in Washington. Perhaps it is time for a little intellectual arbitrage. Personally, I am skeptical of the wage insurance plan. It seems that a worker who earns $40,000 in year one and then $30,000 in year two would end up with higher total income, after taxes and transfers, than a person who earns $35,000 in both years. Maybe there is a good argument for this idea, but I cannot immmediately see what it is. The Commission will on 28 March present ideas for “green taxes” to save energy and cut greenhouse gas emissions. It says that such an ‘ecological tax reform’ could increase the bloc’s competitiveness by shifting the burden away from labour taxes. This Administration will constantly strive to promote an ownership society in America. We want more people owning their own home. It is in our national interest that more people own their own home. That's from President George W. Bush. Maybe it is time for people to recognize that our tax code discriminates against renters--a policy that has little to recommend it on the basis of either fairness or efficiency. I wonder how much the natural rate of unemployment would fall if we eliminated the mortgage interest deduction. What economist is the newest North American Bridge Champion? Hint: He was once a coauthor of mine. If I were dictator of the world, the answer would be fairly obvious. Impose a tax on activities that create greenhouse gases designed to reflect the marginal cost they create. That's the standard economic solution, due to Pigou, for problems of negative externalities. Since the tax brings in additional revenue, combine it with a corresponding reduction in whatever taxes currently have the largest adverse effects. Furthermore, I think it unlikely that income from carbon taxes would be used toreduce other taxes. The clear evidence here is the repeated pattern with regard to wars. New taxes are introduced as an emergency measure for a war, retained long after the war is over; there is always some politically profitable way to spend themoney. In the case of carbon taxes, I am confident that they would be used as an additional source of revenue, perhaps with the argument that the money was needed to ameliorate the effects of whatever global warming continued to occur. This is a classic slippery slope argument: X may be good policy, but if I endorse X, Y will soon follow, and Y is terrible, so the government is better off doing nothing. For example, "Ideally, the government should prohibit people from shouting 'fire' in a crowded theater, but once the government starts regulating speech, we will lose all first-amendment rights and will soon be living in a police state." This form of the argument is popular among the anti-government crowd. Hayek's book, The Road to Serfdom, is one long slippery slope argument. Personally, I do not see how, in a world of climate-change extremists, advocating no policy is a more tenable solution politically than advocating a moderate policy of a modest carbon tax. Ultimately, policy is set by the median voter. When smart economists like David Friedman reject the first-best moderate policy to advocate the do-nothing position, he loses credibility among moderates, and that makes it easier for climate-change extremists to convince the median voter that we need to do something extreme. Note that David's position seems very different from Milton's advice to put "politics aside" when giving economic advice. Maybe it's one of those father-son things. So now, when I advocate raising gasoline taxes and cutting income taxes, and my conservative friends tell me that the plan is politically unrealistic, that the government will just keep the extra revenue instead of cutting income taxes, I can quote Milton. The biography is good, but it is too much of a hagiography. Milton comes off as a bit too perfect to be human. By the way, here is Brad DeLong's review of the book. the biggest leisure gains have gone precisely to those with the most stagnant incomes—that is, the least skilled and the least educated. And conversely, the smallest leisure gains have been concentrated among the most educated, the same group that's had the biggest gains in income. This fact seems consistent with the fact from Saez and Piketty that there has been "a sharp change in the composition of top incomes away from capital income and toward labor income." Alex Brill reports on which party has more incentive to fix the AMT problem. Also, here is Alan Viard testifying on causes and consequences of the AMT. Steven Postrel compares Pigovian taxes and cap-and-trade systems for reducing carbon. Here is my take. Harvard faces off against MIT on the topic of democracy and economic growth. "Communism is idiotcy," he reckoned. "They want to divide up the property. Suppose they did it -- it requires brains to keep money as well as make it. . . . The division would have to be re-made every three years or it would do the communist no good." literature was, for Twain, only a secondary goal. Mr. Krass maintains that the author's "primary focus" -- indeed, his "primal drive" (emanating from his father's bankruptcy) -- was to accumulate great wealth. Of course, being motivated by financial self-interest does not make the work any less great. It just shows the magic of the invisible hand at work. Update: Here is a free link to the article. Well, actually listening too, as I drive between my home and the office: The Kite Runner by Khaled Hosseini. Highly recommended. Here is a new podcast interview with GMU economist-blogger Tyler Cowen. Joe Stiglitz says that prizes are better than patents at encouraging medical research. He makes some good points, but remember that prizes have to be financed, presumably with taxes. The distortionary effects of higher tax rates could be worse than the distortionary effect of the temporary monopolies created by the patent system. Another question is whether we can trust prize committees to make the right decisions. As winner of the John Bates Clark Award and the Nobel Prize, Joe is probably more sanguine about this than I am. Tax cuts, starting with Kennedy, as we all know, increase revenues. 1. If you think the 2001 and 2003 tax cuts increased revenue, why did you vote against them? 2. If you think tax cuts increase revenue, why advocate spending restraint? Can't we pay for new spending programs with more tax cuts? I doubt that, in fact, Senator McCain believes we are on the wrong side of the Laffer curve. But unfortunately, fealty to the most extreme supply-side views is de rigeur in some segments of the Republican party. The h-index is a measure of a scholar's research productivity. It is defined as the largest number h such that the researcher has published h articles each cited at least h times. A blog reader draws my attention to the Wikipedia article on the topic (the link above), which places me as the #5 economist, based on the REPEC ranking. Unfortunately, I cannot claim the honor. The more commonly used data source for academic citations is the Social Science Citation Index, a private data base available online through many university libraries (including Harvard's). The SSCI is not perfect: cites to some journals, such at the Brookings Papers and the NBER Macro Annual, are wildly undercounted, because authors do not cite these journals using a consistent style. But this data base is the standard for counting citations. If you use the SSCI to perform a "general search" on an author, and then click on "citation report," the program gives you the author's h-index. Common names require some adjustment, but all the data you need are there. If anyone finds another economist in the 40+ range, post the news in the comments section. In case you are curious, the Mankiw h-index is a mere 34. According to data from the National Longitudinal Survey of Freshmen conducted in 1999, immigrants account for 26.7 percent of black students at the universities used in the AJE study. At Ivy League schools, the statistic reached 40.6 percent. Because first- and second-generation immigrants only accounted for 13 percent of all 18- and 19-year-old black students, according to the Current Population Survey conducted the same year, the numbers show that recent black immigrants are represented in these universities at higher proportions than in the general population, the study says. America's great universities are in fact becoming global. They are the brand names for excellence -- drawing in the brightest students and faculty and giving them unparalleled opportunities. This is where the openness and freewheeling diversity of American life provide us a huge advantage over tighter, more homogeneous cultures. We give people the freedom to think and create -- and prosper from those activities -- in ways that no other country can match. What worries these university presidents is that at a time when the world's best and brightest are still hungry for an American education, U.S. immigration regulations are making it too hard for students to come here. That's shooting ourselves in the foot. Microsoft Corp. Chairman Bill Gates told Congress on Wednesday that the United States should welcome an ''infinite'' number of high-skilled foreign workers to fill engineering, computer programming and other jobs that otherwise would go vacant. As I have said before, there is a strong case for allowing more skilled workers into the United States. They would pay more in taxes than they receive in government services. And by increasing the ratio of skilled to unskilled workers in the economy, they would reduce the wages of the skilled compared to the wages of the unskilled, thereby reducing U.S. income inequality. In other words, from a U.S. perspective, the economic pie grows larger, and the slices are divided more equally. More efficiency and more equality--a rare twofer. This is not, however, a Pareto improvement. U.S. skilled workers may end up losers, as they would under almost any policy that reduces inequality. The fact that there would be more skilled workers to share the cost of government would, however, offset to some degree the fall in welfare from the downward pressure on skilled wages. More troublesome, from an cosmopolitan ethical perspective, is that unskilled workers abroad might end up losers. That is, if skilled software engineers leave India for Silicon Valley, the unskilled workers left behind in India could well be worse off. Allowing more skilled workers into the United States might exacerbate global inequality, even if it enhances global efficiency. Economist Sarah Hamersma makes the case for the Earned Income Tax Credit. the amount of leisure time per capita hasn’t changed much in the last 105 years....70 percent of the reduction in work hours has been offset by increased hours in school. Wish I could say more, but I have to head off to class. This semester I am taking a graduate course taught by our young star Oleg Tsyvinski--time I would otherwise spend either working or enjoying leisure. Today, Ben Bernanke gave a speech calling for greater scrutiny and tighter regulation of the government-sponsored enterprises Fannie Mae and Freddie Mac. (Here was my attempt to address the issue when I was in public service several years ago.) The news wires reported Ben's speech at 2 pm. The above chart shows the market reaction. Notice that volume spikes and the price falls at precisely 2 pm. 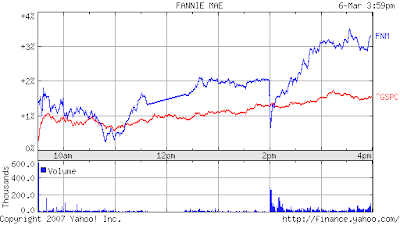 (The blue line above is the stock price for Fannie Mae; the red line is the S&P index. Fannie Mae volume is the lower bar chart.) Within 30 minutes, however, the stock price has fully recovered. By the end of the day, Fannie has outperformed the overall market. Investors, it seems, are not terribly concerned that Congress will take Ben's warnings any more seriously than it took earlier warnings along the same lines. Too bad. If the U of C told me that they were going to revoke my tenure, but add $15,000 to my salary, I would be happy to take that trade. I’m sure many others would as well. By dumping one unproductive, previously tenured faculty member, the University could compensate ten others with the savings. One question that Steve does not address is how department hiring would work in a world without tenure. Now, senior hiring is done by existing senior faculty. If those faculty could start firing one another, the political dynamics of hiring would become complicated and probably untenable. (Here is a related paper.) A university without tenure would likely have to move toward a more hierarchical system with a "boss" in charge of hiring and other major decisions. That is, one cannot abolish tenure and expect university governance to remain the same. Deans would likely have more power over hiring. In my experience, anything that gives deans more authority is a step in the wrong direction, for deans have less information about what is going on in the field or in the classroom than the faculty do. In any event, I look forward to the day when Steve becomes president of some university and gives his experiment a try. I just hope it's not his undergraduate alma mater. According to a new article in Reason, John McCain "has long agitated for mandatory national service." I knew that McCain, unlike many other Republicans, is a fan of AmeriCorps, the volunteer national service program started by Bill Clinton. But mandatory national service is an altogether different animal. It is hard to imagine anything that would push more libertarians from the R to the D column than the Republican party endorsing mandatory national service. I have not heard Senator McCain speak on this topic recently. If anyone has a reference, please post it in the comments section. Economist Arnold Kling opines on the political economy of alternative energy. Harvard is widely regarded (I believe correctly) as having ascended to the top position in the profession. But will Glenn be willing to repeat this in the future when we are competing with MIT for students and faculty? I've been giving some thought to writing my own textbook (not in Economics-so fear not!). What advice can you give for those of us who dream to write? Having been in the textbook writing business for almost twenty years, I have to admit an unfortunate fact: My sense is that most professors who start down this path regret it. Some start writing a textbook, find that they do not enjoy the activity, and abandon the project. Some write enough that the publisher sends the partial manuscript out for prepublication review, receive the bad news that reviewers don't like it, and then abandon the project. Some finish the book but experience disappointing sales; they abandon the book after one or two editions. A fraction of those who start writing textbooks--I would guess about one fifth--make it past those three hurdles and find themselves with a successful book. Such a book can continue for many editions. Samuelson's classic text, for example, was a leading book for introductory economics for about a half century. The author is too busy to give the project the time it deserves. The author is not particularly careful. The author has a writing style that is too dense or too mathematical for the intended audience. The author has views of the field that are too idiosyncratic to appeal to the vast majority of instructors who teach the course. It takes a tremendous amount of self-awareness to recognize yourself in these descriptions. People are reluctant to view themselves as careless or idiosyncratic. Few academics will admit their writing is hard to follow. Such lack of self-awareness is one reason so many unsuccessful textbooks are written. I view textbook writing, like classroom teaching, as a good use of my time. One benefit is pecuniary. Few people in the world earn a living just creating knowledge. Most academics spend some of their time imparting knowledge as well. Giving lectures is one way of imparting knowledge; writing textbooks is another. So far, I have been able to make enough money imparting knowledge to students that I have not had to spend time on other activities, such as paid consulting, to put food on the table. teach economics, you have wide latitude in choosing what material to include and how to present it. In making these choices, you give your own "spin" to the subject and help determine the views of your students. Although classroom teachers and textbook writers share this responsibility, textbook writers reach a larger audience. For those who want to bequeath their view of economics to the next generation, textbooks are the most efficient medium. Indeed, because textbooks are so important in shaping the field, many of the most prolific writers in academic journals are also textbook authors: Samuelson, Baumol, Blinder, Stiglitz, Barro, Dornbusch, Fischer, and on and on. you otherwise would. Preparing a lecture or drafting a textbook chapter reveals holes in your understanding. And, sometimes, as you try to fill these holes, you get ideas for research. Put simply, imparting knowledge and creating knowledge are complimentary activities. That is why these two forms of production take place in the same firms, called universities. On the trade deficit: The reason for the trade deficit ... is primarily, to my mind, the capital account surplus. It's not the trade deficit per se. It's that people want to invest in the United States. ... I think of that as a good thing. Here's an interview with Nobel winning financial economist Myron Scholes. we can too easily be held hostage to the economic decisions being made in Beijing, Shanghai and Tokyo. To me, this seems excessively alarmist and a bit xenophobic. I am skeptical that economic policy decisions made abroad could hold the U.S. economy hostage in any meaningful sense. But click on the link and judge for yourself. trade helps Americans provide for their families. When special interests seek protection in the name of low-wage workers, we should acknowledge that limitations on imports do not benefit the vast majority of Americans. They deny people the freedom to choose from a broader array of goods and services, and impose a cruel tax on people who rely on low prices to stretch their family budgets. The cost of protectionism falls most heavily on those who are least able to afford it – the poor and the elderly. In today's NY Times, economist Austan Goolsbee asks what motivates the superrich. Oddly, Austan's calculations assume a return on assets of 10 percent. Can one really achieve a 10 percent return after accounting for inflation and taxes? It seems high to me, if we are thinking about a balanced portfolio of stocks and bonds. At a more modest return, say 4 percent, providing for heirs is a somewhat more plausible motive than Austan gives it credit for being. Remember that the number of heirs is approximately doubling every generation--a rate of about 3 percent per year. So consumption smoothing among you and your heirs would allow you to annuitize your wealth at a rate of only 1 percent. And if you want your family's consumption to grow over time, the annuitization rate would be even lower.